(Nanowerk Spotlight) Motivated by the outstanding performance of graphene, graphene-like 2D materials have been intensively investigated, such as topological insulators, transition metal dichalcogenides (TMDs) and black phosphorous. 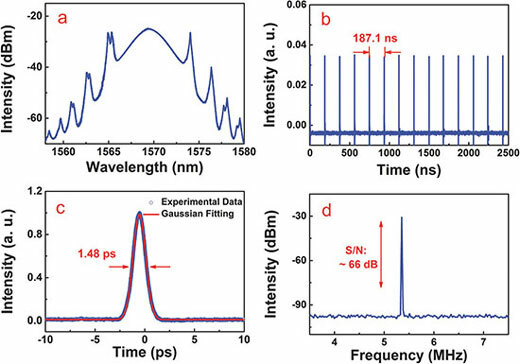 Recently, 2D titanium disulfide (TiS2), a typical TMD, is found to have strong light absorption properties from visible to infrared region, which is highly attractive for applications in nonlinear photonics. In a new study from Shenzhen University (Advanced Optical Materials, "Broadband Nonlinear Photoresponse of 2D TiS2 for Ultrashort Pulse Generation and All-Optical Thresholding Devices"), a novel saturable absorber device is successfully fabricated based on 2D TiS2 nanosheets for ultrashort pulse generation and all-optical thresholding at the communication band. The structure of titanium disulfide consists of a Ti layer sandwiched between two S layers in an octahedral configuration. Interlayer bonding is impacted by weak van der Waals forces, offering potential for exfoliation from the bulk to ultrathin few layers. In this work, semimetallic TiS2 nanosheets with uniform morphology and narrow size distributions were synthesized via a typical colloidal chemistry method. To ensure good performance and reproducibility, TiS2 nanosheets with about 14 atomic layers were selected for the fabrication of optical devices. As confirmed by femtosecond laser Z-scan measurements, the researchers found that their devices feature a broadband nonlinear optical response from 400 to 1930 nm. Despite the near zero band gap structure, which is similar to that of graphene, the experiments showed that TiS2 nanosheets possess a higher modulation depth (18%) at the communication band than that of graphene (6.2%). Besides, the saturable intensity of TiS2 was determined to be 9.91 ± 0.32 MW cm-2, which is also higher than that of graphene (0.61 MW cm-2). As a result, the TiS2 film could be used in a fiber laser to generate ultrashort pulses in the range from visible light to mid-IR. To further prove the saturable absorption properties, the researchers utilized the TiS2 nanosheets as a saturable absorber in a passively mode-locked fiber laser. It exhibited outstanding ultrashort pulse generation performance with pulse duration of ∼1.04 ps (FWHM) centered at 1569.5 nm, as shown in Fig. 1. The corresponding time bandwidth product (TBP) was 0.34, which is very close to the transform-limited value of the sech2 pulse profile (TBP = 0.314), indicating that the soliton pulses were output with little chirping. Furthermore, the mode locking state remained stable when the pump power was increased to 30 dBm, which indicates that the optical damage threshold of the TiS2 saturable absorber device was higher than 24 dBm. At the maximum pump power of 30 dBm, the maximum obtained pulse energy was inferred to be 5.05 nJ. 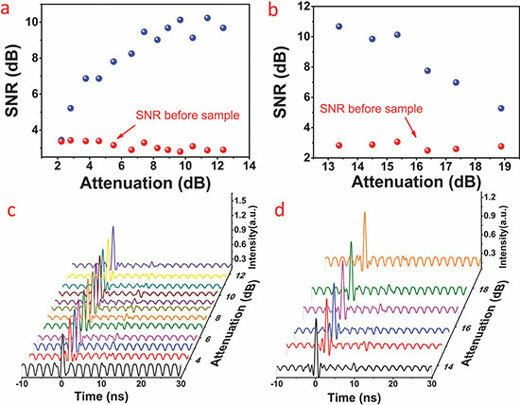 All-optical thresholding can be used to suppress the noise ratio, which results in improving the signal-to-noise ratio (SNR), and in turn improves the quality of the communication signal. Based on the nonlinear optical saturable absorption effect of TiS2, the high peak power optical pulses experienced less absorption by the TiS2-decorated microfiber. The TiS2 nanosheet-decorated microfiber with an evanescent-field enhanced light-material interaction on the sidewall of the microfiber was integrated into a communication system as a noise suppressor. In the system, a variable optical attenuator (VOA) was adopted to modulate the input signal incident to the sample. By adjusting the VOA, a pulse with notably suppressed noise was obtained. In Fig. 2, the SNR increased from 1.902 dB before the sample (see Fig. 2a) to 10.68 dB after it (see Fig. 2b) while the SNR was only 4.294 dB when a bare microfiber without any sample was incorporated into the system (see Fig. 2c). In addition, the pulse SNR remained unchanged for 80 minutes (see Fig. 2d), which strongly manifests the excellent stability of this device. The entire evolution process of pulse waveforms was recorded in Fig. 3. Initially, the input power was higher than the saturable power. Nevertheless, as the VOA increases, the input power was close to or even lower than the saturable power. The transmittance of the pulse was higher than that of the noise. As a result, starting from 2.2 dB, the SNR increased with the attenuation value (see Fig.3a) and the process was demonstrated in Fig. 3c. After the state of Fig. 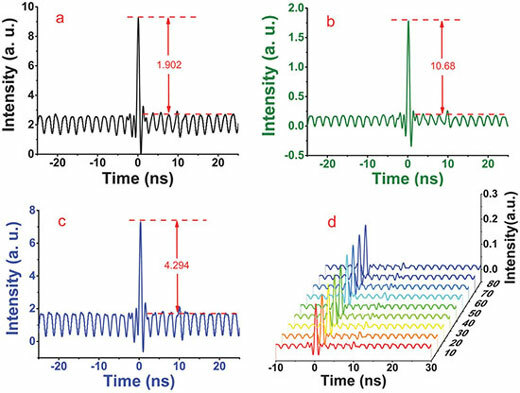 3a,c, massive noise was produced when the incident optical power toward the detector was sufficiently weak, and the SNR of the pulse waveform decreases correspondingly (see Fig. 3b,d). To conclude, this work proposes that TiS2 nanosheets are a promising candidate material for practical devices with broadband nonlinear photoresponse. Provided by Shenzhen Engineering Laboratory of Phosphorene and Optoelectronics, Shenzhen University, as a Nanowerk exclusive.